This is the second in a series of posts about the BugPhoto approach to macro photography. 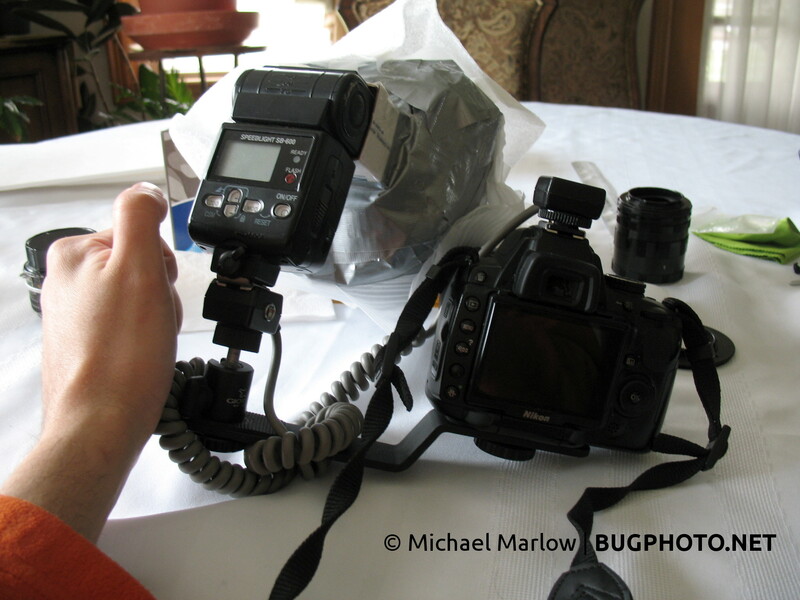 The current BugPhoto rig, a view from the front. First things first: this rig is built for handheld macro photography, and rarely will you see a photo from me that employs a tripod. Why handheld? Mostly it’s because insects and spiders don’t stay still. They move fast. Erratically. They change directions quickly, leaving me guessing what’s the next move; holding my breath if I’m trying to keep them in the viewfinder and maybe stifling a curse under my breath. And then they stop. Maybe to feed, maybe to rest, to clean themselves up. Either way, that’s my moment and I need to find my angle: it’s the one that aligns the subject’s most interesting or desired features and the sliver of sharp focus (i.e. shallow depth of field) to which shooting at high magnifications limits a photographer. Adjusting hands and arms is more efficient than adjusting a tripod, and as the photographer I can adapt to the subjects movements fluidly. So essentially, there is a trade-off between mobility and stability, and I have chosen mobility. That means I have also chosen to introduce camera-shake (and I have shaky hands! ), so on top of potential sudden or quick movements by the bugs, I must have a faster shutter release if I want to freeze the subject and avoid blurry elements. The most basic ways of accounting for mandatory fast shutter speeds are to adjust the ISO and aperture settings — which leads us down the rabbit hole of underexposure. To oversimplify a little, ISO becomes a trade-off between noise and brightness, and aperture becomes a trade-off between depth of field and illumination. The noise is a matter of taste and tolerance, but at a certain point a shallow depth of field will render the subject as little more than swathes of blurry colors. If you’re into abstract expressionism, not a bad way to go, but for representational nature photography, we need a smaller aperture which means we need more light. Enter the flash. 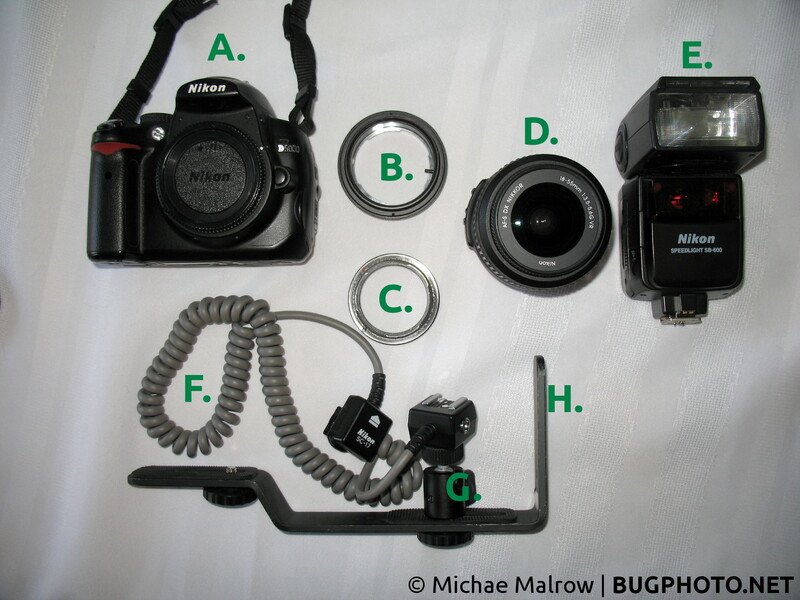 A (mostly) broken down arrangement of my handheld macro photography rig. The components include (A) Nikon D5000 camera, (B) Fotodiox Reverse Lens Aperture Control Accessory, (C) Reverse Lens F-Mount/52mm filter adapter, (D) Nikkor 18-55mm 1:3.5-5.6G VR lens, (E) Nikon Speedlights SB-600 hotshoe flash, (F) Nikon SC-17 off camera flash cable, (G) Giotto mini ball head, (H) Nikon SK-E900 flash bracket. Now, if I told you, Alice (a.k.a. Dear Reader), that we have left Wodnerland…would you believe me? No? That’s good, because naturally we’ve got another tradeoff. In particular, the balance between the flash’s magnanimous light and unforgiving reflections looms large. Diffusion is the solution, and with some tape, coke cans and some foam sheets or paper towels, anyone can soften up that light. I won’t say much about diffusion for now, except that it’s crucial to avoid and/or mitigate distracting glare and blown highlights in your photos. I’ve included some photos below to give you an idea of the full rig complete with my modified Coke can DIY diffuser by Lord V on Flickr, (mine uses 2 cans instead of one; you can look up the original design here). I have written about diffusers before, and you can click here to read more about that. 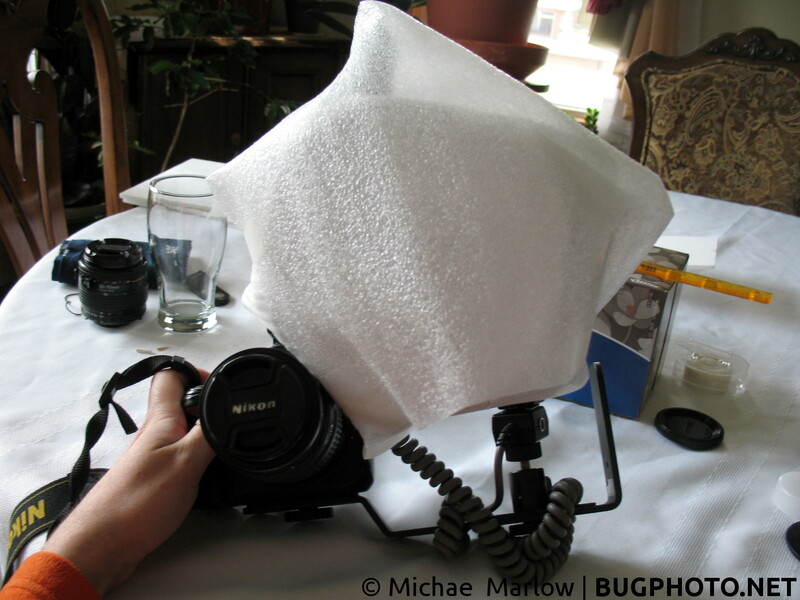 The bug’s view: the rig has a 2-Coke Can DIY Diffuser mounted (with Scotch tape) onto the flash head. The photographer’s view: the rig has a 2-Coke Can DIY Diffuser mounted (with Scotch tape) onto the flash head. 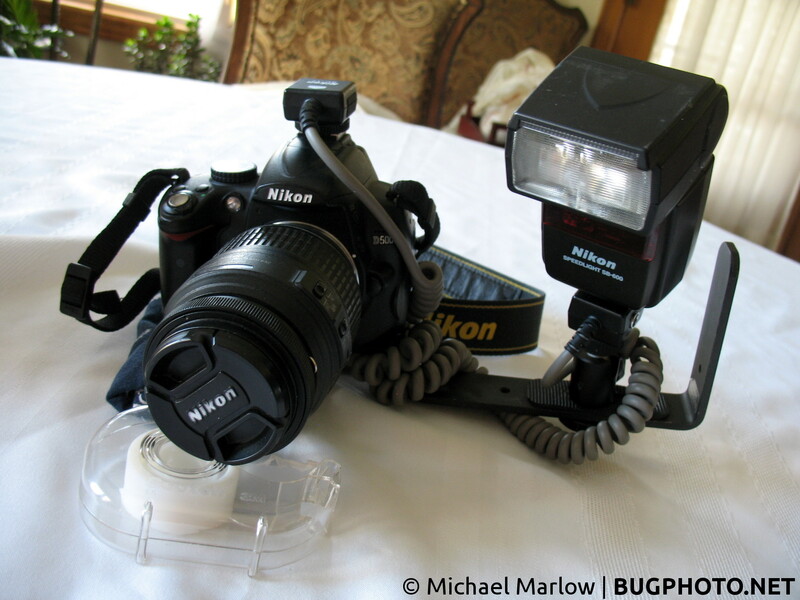 In my current setup, I use a Nikon SK-E900 flash bracket to give me more flexibility in positioning my flash. This accessory was originally designed for a small point and shoot camera, but I’ve adapted it with pleasing results to my purposes. It’s not the most ideal solution — something better might be, say, a friction arm, something I used to have incidentally, before it broke on me — but throw in a little Giotto mini-ball head and I get enough flexibility. Perhaps the biggest downside to this bracket is that the flash is always on the left side of the camera which depending on the ambient light can leave heavy shadows on one side of the subject. With macro, that’s the story: there’s always another trade-off, another rabbit hole to go down; the key is to be a little mad about the whole thing. This rig is not the perfect set up: it’s a bit on the cheap, which a limited budget will force on the photographer. It is also pretty hefty and somewhat inflexible, both qualities that have stopped me in my tracks: sometimes when I have to hold that branch steady with one hand, the other one can’t bear the lopsided weight of the rig long enough; sometimes the flash is out too wide to get the angle before butting up against a proverbial (and sometimes a literal) wall. The flash diffuser can be cumbersome, too, but cut up coke cans at least have some flexibility, at least compared to a rigid bracket; I just have to hope it doesn’t scare of the bugs. (And it does sometimes!) All in all, however, it works for me; I get good results relative to its limitations so I’m happy for the time being. It’s fairly basic which I also like because it keeps my basic skills sharp, and they are usually the most important ones. In the next post of this series, I’ll focus on the reverse lens technique and its features and challenges. Posted in Photo GearTagged BugPhoto Guide, camera accessories, camera rig, D5000, flash bracket, Macro Photography, reverse lens, reverse lens adapterBookmark the permalink.